Unger is ushering in a new age of enlightenment with the launch of HiFlo™ nLite – the most advanced water-fed pole system to hit the market in years. The highest professional cleaning standards are even easier to achieve with the HiFloTM nLite system thanks to its perfect balance between weight and rigidity. Not only are the poles lighter than conventional versions, the use of cutting edge design and technology means that even when extensions are added rigidity is not compromised, and yet the weight and ergonomics of the system still make it a pleasure to use. The four section master pole cleans up to a height of 6.63m/22ft, but taller locations are easily reached by adding two-stage extensions to the base of the master pole. 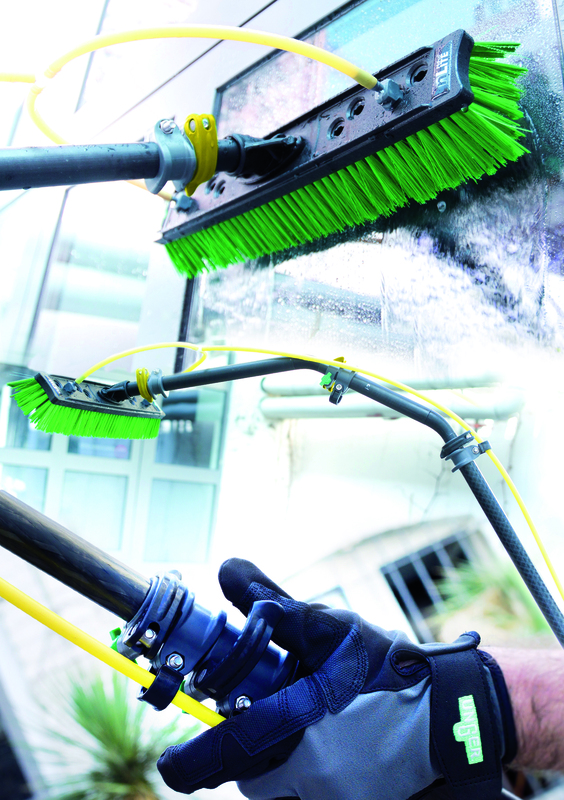 These extensions, each adding another potential 11ft of reach but crucially not adding anything to the width and feel of the pole, measure 35mm in diameter – an optimum size that fits easily into the hands of the professional for quick and comfortable cleaning. Even if you’re cleaning to a height of around 65ft the HiFloTM nLite offers the ‘gold standard’ in terms of ease of use and results – because it combines just the right amount of rigidity to control your cleaning, but in a lightweight system that’s better for the professional to use. Every part of the new system has been designed specifically with the user in mind. The clamps, which adjust pole height or attach the extensions, are simple to operate – no fiddly allen key-type devices needed – and easily adjustable to ensure the right tension; plus the gooseneck attachment is made from carbon fibre, again keeping weight to a minimum. Even the brushes are lighter – but that doesn’t mean less features or functionality. On the contrary, a selection of brushes are available, one of which, at 60cm/24in, is large enough to quickly clean solar panels, featuring bristles designed to get into the smallest corner and help with scrubbing actions. Whereas conventional brushes usually only have two jets, HiFloTM nLite brushes can feature up to ten quick release jets, making it much easier to control the water flow and rinse surfaces. If you want to be ‘enlightened’ the HiFlo™ nLite will be unveiled to the global cleaning industry on stand 1.205 at ISSA/Interclean, Amsterdam RAI, Netherlands 8-11 May. ← How to start a window cleaning business for rookies.